Many bloggers are very active in the climate change debate around the globe. In advance of an expected intensification of that debate this year, I’ve written a new essay about the natural warming of the global oceans. It’s titled “The Manmade Global Warming Challenge”. That essay and an introduction are published in .pdf format so that interested persons can download them and refer to them at their leisure. I hope many bloggers will find them useful in their debates. For those new to this discussion, the essay includes my easiest-to-understand descriptions of how strong El Niño events are responsible for the vast majority of the warming of sea surface temperatures over the past 3 decades. It’s provided after a moderately complex description that includes links to animations. The intent of the simple description is to reinforce the more-detailed explanation. That is, to show and tell what I’ve just shown and told. The essay also includes discussions of the natural warming of ocean heat content, including a couple of the cartoon-like illustrations from my ebook Who Turned on the Heat? The full essay titled “The Manmade Global Warming Challenge” is here (42MB). And the introduction is here (4MB). The draft of the upcoming U.S National Climate Assessment Report was recently released for comment by the U.S. National Climate Assessment and Development Advisory Committee (NCADAC). Its Executive Summary portrays manmade global warming/climate change like most political documents of its kind; that is, it characterizes the climate model-dependent hypothesis of manmade global warming as being based in sound science and it portrays recent weather events as products of greenhouse gas-driven climate change. Further, NCADAC is supported by NOAA, who recently published their State of the Climate report for 2012. NOAA, unfortunately, has difficulty determining something as simple as what years are La Niña years by their own definition. I suspect NOAA will correct their mistake sometime in the future, but with less fanfare than they provided for the erroneous headline that “2012 was also warmest ‘La Niña year’ on record”. Later this year, politicians from around the globe will negotiate the language of the Summary for Policymakers of the 5th Assessment Report (AR5) from the Intergovernmental Panel on Climate Change (IPCC) and they will unleash it upon the world shortly thereafter. As a result, mainstream media coverage of global warming and climate change—or whatever new catch-phrase they choose to use—should reach fevered levels in 2013. I plan to be more active in the discussions this year, spending time at magazine, newspaper and TV news blogs around the globe in an effort to reach a wider group of people. To aid in those endeavors, I’ve published an illustrated essay titled “The Manmade Global Warming Challenge”. If you’re a frequent visitor here at Climate Observations and at WattsUpWithThat, you’ve already heard my message: ocean heat content data since 1955 and satellite-era sea surface temperature data indicate the oceans have warmed naturally. I’ve also produced a much smaller teaser—“Introduction to the Manmade Global Warming Challenge”—which will hopefully grab readers’ attentions and prompt them into downloading the full presentation. The introduction and the essay were created in PowerPoint, then converted to pdf. The text should be easy to read, and I’ve formatted the graphs with the thicker curves than I normally use. The “Manmade Global Warming Challenge” is a large document, 42MB, due mostly to the black background. (With a white background the document in pdf form is only 4MB.) There are 180+ slides, with lots of information and illustrations, and it reads very quickly. The full essay is Here, and the introduction is Here. Please feel free to provide links to “The Manmade Global Warming Challenge” in your discussions around the blogosphere. INTERESTED IN LEARNING MORE ABOUT THE NATURAL WARMING OF THE GLOBAL OCEANS? I’ve searched sea surface temperature records and ocean heat content data for more than 4 years (more than 3 years for the ocean heat content data), and I can find no evidence of an anthropogenic global warming signal. That is, the data indicate the warming of the global oceans was caused by Mother Nature, not anthropogenic greenhouse gases. I’ve recently published my e-book (pdf) about the phenomena called El Niño and La Niña. It’s titled Who Turned on the Heat? with the subtitle The Unsuspected Global Warming Culprit, El Niño Southern Oscillation. It is intended for persons (with or without technical backgrounds) interested in learning about El Niño and La Niña events and in understanding the natural causes of the warming of our global oceans for the past 31 years. 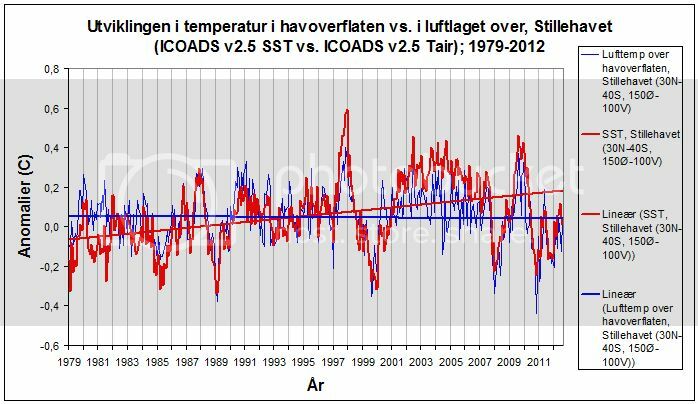 Because land surface air temperatures simply mimic and exaggerate the natural warming of the global oceans over annual and multidecadal time periods, the vast majority of the warming taking place on land is natural as well. The book is the product of years of research of the ocean heat content data and satellite-era sea surface temperature data that’s available to the public via the internet. It presents how the data accounts for its warming—and there are no indications the warming was caused by manmade greenhouse gases. None at all. Please buy a copy. Credit/Debit Card through PayPal. You do NOT need to open a PayPal account. Simply scroll down to the “Don’t Have a PayPal Account” purchase option. It’s only US$8.00. Bob, your explanations of many details are getting clearer with each iteration. One thing still leaves a gnawing feeling, however, and that’s about the energy flux into and out of the oceans. You deal with it somewhat by explaining the input from sunlight and the redistribution of heat throughout the ocean basins, but there’s a gap concerning how much heat is dissipated to the atmosphere and eventually to space. Surface waters all over the globe have to be radiating heat energy and convecting it by evaporation. but apparently unequally in the different ocean basins. For example, the North Atlantic is warmer now than 30 years ago. Why is the heat being retained in the surface waters? Since the data seem to say that it isn’t going into the deep oceans, do you have a grasp on where and how much is escaping the surface waters? We can see the North Atlantic warmed in response to the El Niños of 1986/87/88, 1997/98 and 2009/10. The warming occurs without a direct exchange of heat. My normal example here is with respect to the tropical North Atlantic. It warms in response to an El Niño, through teleconnections, because the El Niño causes the trade winds to weaken in the tropical North Atlantic, which results in less evaporation. With less evaporation, the sea surface temperatures warm. One of the frustrating parts about the state of climate science as it exists today is that there are climate scientists who are capable of confirming responses like that, like Trenberth, but they wouldn’t attempt to confirm it—first, they’d have to acknowledge the existence of residual waters from strong El Niño events, and, second, they’d be confirming the unforced warming of the North Atlantic caused by an unforced warming of the North Pacific. 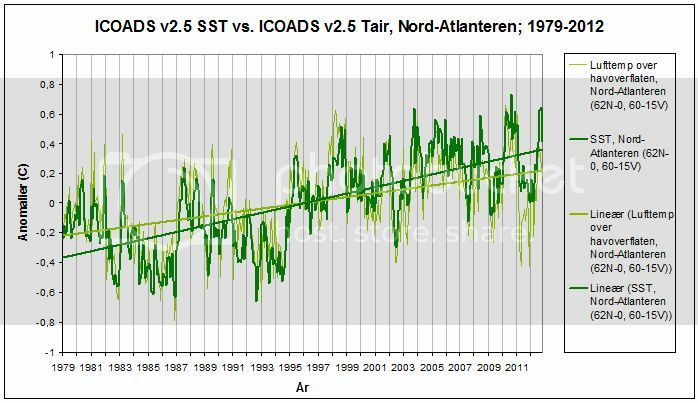 The North Atlantic also warms in response to the Atlantic Multidecadal Oscillation, and there are many theories about what makes it tick. There’s a recent paper (that I need to investigate) that describes large pulses of warm water being carried poleward by western boundary currents (Kuroshio Current south of Japan, the Gulf Stream, etc.) after strong El Niño events. No mention in the press release about the opposite happening during La Niña events, and I haven’t purchased the paper yet to see if they investigated La Nina. And then there was that recent paper that said, when the surface waters of the North Atlantic are warming, the deep waters are cooling, so there’s no overall change in heat content there. I think IceCap has a post about that paper a month or two ago. Gary, in short, I don’t have all of the answers, but no one else does either. All I can do is to keep investigating—and try to get more interest in the obvious natural warming of the global oceans. Bob, thanks for the reply. Not expecting you to have ALL the answers, but you are doing a good job at having many of them. I’m not complaining about the warm North Atlantic, it reduces my snow shoveling in southern New England winters (97-98 was a doozy IIRC). You may be on to something with the strength and breadth of the Gulf Stream. Teleconnections as an explanation make me suspicious — spooky actions at a distance with no likely known mechanism is a little too hocus-pocus. I’ll accept reduced atmospheric circulation causing fewer clouds and permitting increased absorption of sunlight, though, as at least an attempt at an explanation. Gary’s spooky actions at a distance, being a reference to particle physics, goes too far. Stay with classical phenomenon. Take a 20 ft. rope and tie it to a small tree. Back off and move your end of the rope, say sending a sine wave (of energy) from your arm to the now shaking tree. Then stop moving. Except for a little time for the inertial motion of the tree to dissipate, it too will stop moving. A connection, yes. Spooky, no. Bob, I want to get a copy of your book sent to me in South Africa. How can I arrange to pay for the extra cost of doing that? In a way you could almost look at the Atlantic Ocean as a Pacific Ocean tilted 90 degrees into an erect position. In other words, in the Pacific the general flow of heat goes from East to West and in the Atlantic it goes from South to North. What comes out here is that there is a general heat uptake in the South Atlantic (and East Pacific) and a general release of heat in the North Atlantic (and West Pacific) to the atmosphere. In between the energy absorbed in the first region has been transported to the second. Note how the main trunk of the massive Atlantic equatorial ocean current crosses from the southern to the northern hemisphere (deflected by the South American coastline) bringing large amounts of heat absorbed in the subtropical high region to the south to the northern basin. There is no similar exchange going the other way. 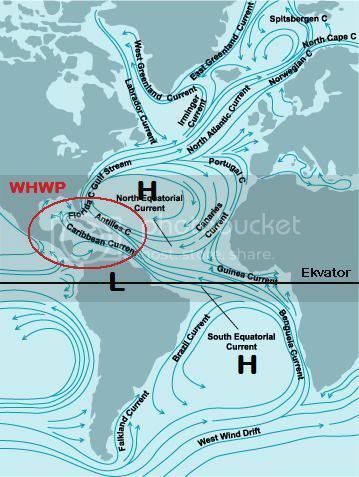 The extra amount of heat brought and constantly supplied across the equator to the north tropical Atlantic will then have a hard time escaping the confines of the North Atlantic basin (the same challenge doesn’t seem to face the heat going south in the South Atlantic basin), being brought west to the Western Hemisphere Warm Pool (WHWP) and/or north with the mighty Gulf Stream, transporting the heat meridionally all the way to the Arctic where it can only escape via dissipation or by sinking. As I understand it, the atmospheric teleconnections between the East Pacific and North Atlantic oceans also affect the tropical South Atlantic. But the heat generated there does not accumulate to the same extent as in the north, since a fair share of it is brought out of the region and into the North Atlantic instead. I think part of the explanation for the AMO amplification of the ENSO signal is to be found here. I have published links and a very short teaser in my climate and weather pages. Bob great stuff, it really shows clearly your approach, maybe because it’s so clear I really understand what you are saying which is leaving me with some worries and criticisms. The first thing to say is the spatial pattern of obs versus model ensemble is truely awful (such as page 41). But I have a concern. The ensemble is an average of many runs, all doing ENSO badly, but also doing ENSO in many different ways while the observations are obviously just one run. The models do not try to follow the same historical pattern of ENSO as the obs so that some runs may be dominated by La Nina-like conditions in that period while others El Nino-like, And other natural modes will also not necessarily be syncronous in each run givng the homogenous warming seen in the ensemble mean. I would like to pick my way through individual model runs to see how they look compared to observations just to be sure. The averaging process could be whats making the models look so bad. You don’t explain how or where you generaed the model map, any tips or pointers? I got a bigger problem with your work but it’ll have to wait until later as I’m getting called for husband duties. John, I assumed, incorrectly it seems ;-), that a little hyperbole was permissible. What I take issue with is the idea that, for example, growth rings of a lonely bristlecone pine or siberian larch could tell what’s happening with global temperatures through “teleconnections.” Environmental factors, like politics, are local — although I’ll grant that some ripples can spread out, attenuating with time and distance, of course. I’m working on understanding the different behaviors of the ocean basins that Bob has identified. John Ledger: My book is only available as an ebook in pdf format. I have no plans for hard copy editions. I also do not plan to make it available through Amazon Kindle. That’s the key point of your argument, HR. If the models are simulating the processes of ENSO incorrectly, and they all are, then they cannot determine the true cause of the warming. For the trend maps, I used the KNMI Climate Explorer. After you select, for example, the Reynolds data, click on the “correlate with a time series” option from the right-hand menu. At the top of the page there’s the choice of “System-defined monthly timeseries”. Select time. Scroll down to the “plot options” and select regession. Input the coordinates, contour levels (shown on the maps on page 41), and scroll down to “options” There, select averaging over 12 months, the anomalies option, and the years of 1982 to 2012. Click on correlate. Sometimes it can take up to 30 seconds for it to produce the trend maps. I’ll look forward to hearing back from you eventually. Sorry, I could have expressed myself better. A problem of blogs, for me at least, is that some folks will take a word or phrase that has a meaning in one situation and claim it can have only that meaning regardless of the new context in which they elsewhere find it. For example, Bob T. used the word ‘create’ in a post last year and was taken to task because the reader interpreted that to have a sense of “out of nothing.” The intent was to express that the western Pacific Ocean “acquired” warmth, not that energy was being created via some impossible fashion. The term ‘teleconnections’, likewise, seems to invite some to misdirect their thinking – I will note your use of the phrase “no likely known mechanism” above. Insofar as there are known mechanisms, I was misled in interpreting your overall comment. The problem I have is that you seem to suggesting that if GHG warming is dominant then we should see a steady warming (with some ‘noise’) similar to what we see in the global trend in your graph on page 126. 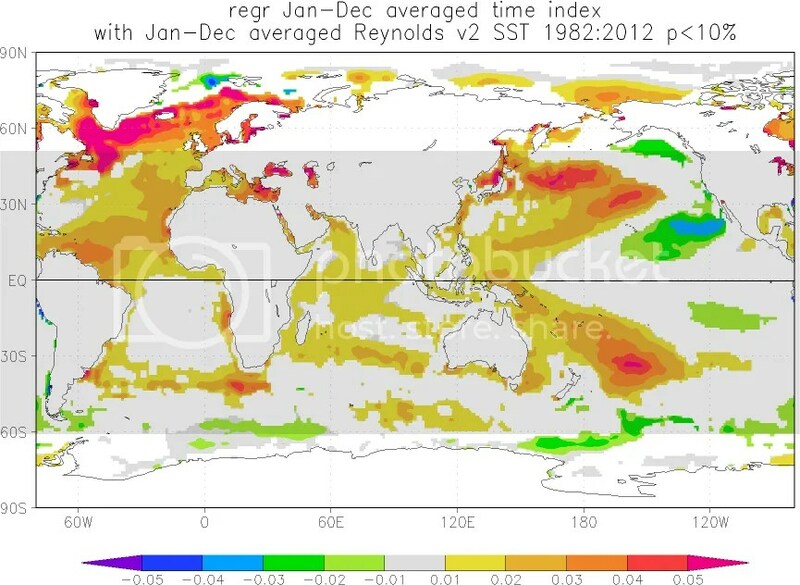 But when you look at regions you see a different pattern that in some regions it is dominated by ENSO events. So therefore it must be ENSO that is controlling the warming. The problem is I don’t think anybody disagrees that energy is moved around the system by several mechanisms one of those being ENSO and so therefore regions will show different rates of temperature change dependent on the particular modes that are acting on the system at any on time. GHG warming is not going to replace those natural patterns but be superimposed on them. Take one of your examples the OHC of the tropical Pacific (page 96). As you describe there is a mechanism for energy build up in the subsurface waters during La Nina and another mechanism for energy to be lost from that region as warmed waters move into other regions. GHG warming can only be super-imposed on that process not replace it, but given the magnitude of the fluctuations in that region the chances of seeing that addition energy in such a short time period would seem impossible by your method. In essence you are actually making the case for looking at the system as a whole in order to identify the GHG fingerprint because individual regions can be so dominated by short to medium term inflows and outflows of energy from different parts of the system. HR: Argue as you may, but there’s no sign of an anthropogenic global warming signal in the sea surface temperature data during the satellite era or in the ocean heat content data since 1955. The hypothesis of manmade global warming is dependent on climate models, but climate models do not simulate the natural processes that cause the oceans to warm. If and when climate modelers decide to be honest with themselves, the models may serve a purpose. Until that time, they don’t. Incorrect. In reality, I’ve identified why each process has to be looked at individually, because each individual process contributes to the whole. OK Bob one point at a time. What do you think the GHG warming signal would look like in the regional trends? In your document you keep ask if we can see the GHG warming component in your graphs but don’t actually say what you think it should look like if it really existed. I’m still surprised by the large number of people who ignore global warming and I believe the majority of us don’t underestimate the real threat that could have detrimental consequences if the warnings are not heeded. That’s why I’m glad that I live in a city whose inhabitants are fighting the threat of global warming by taking part in the so-called Greenest City 2020 Action Plan whose aim is to eliminate the negative impact that our actions have on the environment. And global warming is one of the key areas in which the right decisions, if put into practice, may produce the desired effect even in the short term. What I believe is immaterial. I present the four graphs briefly. The presentation runs through a cycle a few times. That is, I present the four graphs individually, asking: Can You Find the Manmade Global Warming Component Here? That’s for individual readers to decide. Then after I remove the short periods of naturally caused warming (with the exception of the east Pacific) I ask the readers: Does This Agree with Your Understanding of Manmade Global Warming? 2. Why the warming of the sea surface temperature anomalies of the Atlantic-Indian-West Pacific dataset depends the strong El Niño events of 1986/87/88. 1997/98 and 2009/10. 4. Why the warming of the extratropical ocean heat content is dependent on a 2-year climate shift. Why don’t those papers exist, HR? Climate models do not simulate ENSO (and other natural factors) properly. In fact, some of the climate modeling groups didn’t even bother to simulate ENSO in the models submitted for AR4. If the climate models used to support the climate model-dependent hypothesis cannot simulate that factors that caused the warming, then they cannot be used to determine the cause of the warming we’ve experienced or to predict what the warming will be based on projections of future greenhouse gas emissions. stephanie, I’m trying to decide if your comment is spam. If not, you obviously haven’t bothered to read or understand the post or the documents attached. Bob, I was thinking about the general effects of El Niño, La Niña, or a neutral condition, on the northern section of South America. Some of my readers in Spanish have asked these questions. Any thoughts you may want to share? I was referring to the Caribbean and Atlantic zones of Colombia, Venezuela and Brasil. Andrés Valencia: My apologies to you and your readers. My areas of study are primarily the impacts of El Nino and La Nina on sea surface temperatures and ocean heat content. I spend very little time examining land surface temperature and precipitation responses to ENSO. Sorry. It’s not immaterial Bob. If you don’t know what the GHG signal looks like then how can you know what to look for? My point would be that at the regional scale it is not a simple case to find a GHG signal in 20years of data. Especially in regions that show the greatest short term swings from natural variability. What you show is fasinating and certainly needs to be understood further but I don’t see how GHG warming has yet been rules out. I’m in complete agreement with you that the models fail with ENSO and at regional scales (in part because it fails with ENSO). I do know what the GHG signal is supposed to look like, HR. But my understanding of it is immaterial. It’s for the individual readers to decide. Why on earth did you chose the black background, which is the most difficult of all on the eyes? Jim eagle, for me it was easier to read than other backgrounds. Sorry. The first graph covers a large chunk of the Pacific Ocean (30N-40S, 150E-100W). The second a significant part of the North Atlantic (62N-0, 60-15W). Watch how the SST trends are distinctively steeper than the Tair trends in both diagrams. The temperature gap between the two layers has gradually widened through time. How would an air layer cooler than the surface in the first place and with a lower warming rate on top of that force the warming of the surface? It couldn’t. And it doesn’t. These two graphs show that the ocean at large has increased its total heat loss to the atmosphere (mainly through intensified evaporation/convection) as a response to the surface warming. This is the direct opposite of what we would expect if GHGs (‘an enhanced GHE’) were responsible for the warming in the long term. There is no signal or sign whatsoever of GHG warming of the oceans anywhere. Bob is quite correct. It could still be there somewhere, you say? Overwhelmed, but still there? OK. So, where? Point it out. You simply wouldn’t find it in an ocean strengthening its average cooling rate (induced by direct, solar forcing) rather than having it restricted (caused by INdirect, atmospheric forcing) during its long term warming. Science is not some sort of version of ‘Where’s Wally’. If you have some information lay it on the table for all of us to pick over. Science isn’t simply something that it decided upon by each reader individually. All relevant info up front so we can collectively uncover the truth. The thing is Bob that I think many climate scientists that support the ‘consensus view’ would probably agree with you. There’s going to be no obvious GHG signal in a regional 20 year temperature record that is dominated by large short term natural fluctuations, it’s the wrong subset of data to be looking for it. I have two replies to that statement. First: Yet that’s what you’re trying to do by asking me what I think the greenhouse gas signal looks like. Again, HR, the questions in the essay are for individuals to answer—not me. BTW, I’ve presented the outputs from climate models in numerous posts here. Second: Climate science has mutated into “Here’s Wally” with its nonsensical claims that every weather event is caused by manmade greenhouse gases—when they’ve never proven that the warming was caused by said greenhouse gases. Climate models do not explain the early warming of the 20th century and the only reason they come close to agreeing during the later warming period is because they were tuned to do so. 1. why the sea surface temperatures of the East Pacific ocean haven’t warmed in 31 years. 2. why the warming of the sea surface temperatures for the South Atlantic- Indian-West Pacific subset are dependent on the El Niño events of 1986/87/88, 1997/98 and 2009/10—that is, why the sea surface temperatures there cool without the upward shifts caused by those El Ninos. 3. why the warming of the ocean heat content of the tropical Pacific is dependent on the La Niña events of 1973/74/75/76 and 1995/96. 4. why the warming of the extratropical North Pacific is dependent a 2-year climate shift. Three of those four relate to ENSO and climate models cannot simulate ENSO. HR, have you been hanging out at SkepticalScience. They use terrible debate tactics and you seem to be trying to employ one of them. 20 years? I presented two datasets. One begins in 1981. One begins in 1955. How do either of those come to 20 years? Regional? The East Pacific covers 33% of the surface area of the global oceans, and the South Atlantic-Indian-West Pacific covers another 53%. If the models cannot explain why one hasn’t warmed and why the other one has, then the climate models have no use as a tool to predict future climate. Sea surface temperature and ocean heat content data are precisely the datasets that need to be examined. They have the least amount of noise, the oceans cover 70% of the planet, and their short- and long-term variations in temperature are dependent on ocean processes. To answer the question, natural variation ought to look like a sawtooth function where each downward slope is roughly the same size as each jump up. Over the long term the two (arguably) should cancel out and the overall trend should be flat. Global warming would look like a sawtooth with a superimposed trend, meaning shallower downward slopes compared to the upward jumps. Over the long term the jumps up should exceed the decays, and the line should rise like a staircase. I’d be curious about Bob’s view on it. That’s quite the assumption on your part. On what are you basing it? It can’t be a climate model representation of global warming because climate models don’t model ENSO properly. Are you then speculating? I was basing it on *your* observation that ENSO periodically injects spikes of warming, which decay as the surface heat is radiated to space, and adding a linear trend to it. General equilibrium considerations would suggest that over a long enough period it ought to tend to be flat. I know of no particular reason why it should be flat over shorter terms, but I don’t know of any reason why it should rise or fall, either. It seems like a natural starting hypothesis. Don’t get me wrong – I’d love for you to be right! But it’s blatantly obvious that if you add a linear trend to whatever sawtooth/staircase function you’re expecting, you’ll get another sawtooth/staircase. You can’t tell the difference. There might be global warming there, or there might not. The only way to distinguish them is to make a quantified prediction of the decay rate or step interval or whatever, to explain why the ups recently are bigger than the downs. Nobody will take it seriously if you don’t have an answer to such questions, as I found out when I tried to defend your theory. So yes, I’m speculating. How about you? Hi, Nullius in Verba. Sorry about the short reply last time. I wasn’t sure if you’d just come in to throw a jab or if you were here for a discussion. Given enough time between strong El Niño events, or an absence of them, I would agree. The last strong El Niño in the first half of the 20th Century was the El Niño of 1939-42. There wasn’t another strong event until 1972/73. Between those two El Niño events, global surface temperatures didn’t warm. The 1972/73 El Nino also initiated the 3-year La Niña (1973-76) that provided the initial fuel for the upcoming strong El Niños, until the 1995/96 La Niña. The freakish 1995/96 La Niña shifted up tropical Pacific OHC once again and provided the fuel for the 1997/98 El Nino. The 1973-76 La Niña also preceded the Pacific Climate Shift, which caused sea surface temperature of the entire East Pacific Ocean to shift upwards 0.2 to 0.3 deg C, if memory serves. If we think of ENSO as a recharge-discharge oscillator, then we find that the recharge and discharge have different schedules. The recharge usually takes place during the 3-year La Niñas (1954-57, 1973-76 & 1998-01), but freak events like the 1995/96 La Niña can and do happen. Then there are the strong El Niño events. They can and do periodically release monumental volumes of warm water from below the surface of the west Pacific Warm Pool, and after the El Niño, the warm water is redistributed from the tropical Pacific. No one knows if they’re truly random. One thing is certain, the climate science community has overlooked the greatest variable source of warming on the planet—ENSO. The South Atlantic-Indian-West Pacific data only warms during the El Niño events. Between them, the data actually cools. Actually, the climate science community is responsible for creating models that replicate the processes that cause the oceans to warm, and so far they have been unable or unwilling to do that. I’m only presenting data. That’s all I do. And it does not agree with how climate models and the climate science community portray the oceans should be warming. And the reason I know that is, the modelers have neutered El Niño and La Niña, which is why the climate community only thinks of it as noise. The modelers then have to force the warming of sea surface temperatures with infrared radiation from manmade greenhouse gases. But that’s not how the instrument temperature records indicate the oceans have warmed. At which comment on that thread does the discussion start that you’d like me to comment on? I took a quick look earlier and didn’t find any reference to El Niño on the first few comment pages. I think I agree with all that. The conclusion I had drawn from your presentation of the data was that ENSO did have longer-term effects on global temperature, that it had the *potential* to have a cumulative effect, and therefore you couldn’t distinguish cumulative ENSO from global warming. It didn’t prove there *wasn’t* any global warming – and just on basic physics grounds I’d expect there to be *some* – but it meant you couldn’t tell how much, and you certainly couldn’t identify the rise as being unambiguously a global warming signal. Cumulative ENSO is an additional contributor and an alternative hypothesis, not yet eliminated. Which is an interesting and useful point to argue, except that it isn’t quite what you usually say. You usually give the *impression* of trying to say it’s *all* ENSO. I tried to argue my milder version and got stuck having to defend the stricter version. I tried to argue in that thread that people simplify explanations as much as possible when they’re explaining something new to the untrained layman, but I was guessing. I learnt a bit in the process of having the discussion too, and I’m not sure if I always got it right. The discussion starts around comment 20. It was a little while ago and doesn’t much matter now, but I was curious whether there was anything I could have done better on. Your thesis is excellent work, anyway. Nullius in Verba: You have to consider you are arguing with people who do not want to learn. It’s therefore difficult for you to show them the errors in their assumptions that greenhouse gases warm the oceans. I ran into the same problem at Skeptical Science. They’d rather lie than acknowledge that the hypothesis of manmade global warming is fatally flawed. The instrument temperature record indicates ENSO acts as a recharge-discharge oscillator. As such, it cannot self-cancel over time. ENSO simply contributes more during some multidecadal periods than others, as it has since 1976. BBD is arguing from ignorance. Apparently, BBD cannot read time-series graphs. I have since refined that presentation. Obvious typo. Should read La Niña. It doesn’t make sense to him because he’s only looking at part of the argument. ENSO is responsible for the warming of OHC in the tropics. Changes in sea level pressure (wind patterns) explain the warming of the extratropical North Pacific and North Atlantic. Not a bad explanation. He forgets that solar radiation is also called “penetrating radiation” so it doesn’t need to be “sucked back beneath the waves”. If he’s “not clear” then he has no basis from which to comment. That is, arguing from ignorance is not a good position for Al to present. That was a good comment to end on.